They say you shouldn't count your chickens before they hatch, but according to a market survey Android has laid a lot of eggs in North America. The total number of smartphone shipments will rise by 38% compared to last year for a total of 65.1 million units. Here's the breakdown - RIM is still king of the hill with 43% estimated market share for 2010. They lose 6.2% market share but due to the increase in total smartphones shipped, they will still get a 5.8 million increase in units shipped. 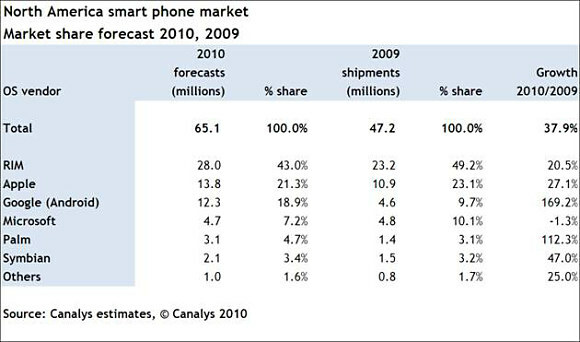 Apple comes in second on the smartphne market, and similarly to BlackBerry, it's to expect a decrease in market share but a modes increase in units shipped. BlackBerry OS, Apple OS and Android OS combined account for a total of 80% of the total smartphone market in the US (sorry, Microsoft). Android is predicted to have an explosive growth, putting it a close third behind Apple's OS - 18.9% market share compared to last year's 9.7%. That's nearly a double. The number of Android smartphones shipped will be 12.3 million, compared to Apple's 13.8 million. Of course, many manufacturers are offering Android phones and only Apple sells iPhone's but still - it's a commendable achievement for the OS nonetheless. If these numbers pan out, the number of Android phones sold will be more than that of Microsoft, Palm and Symbian combined (again, this is about North America only, not the whole world). The Microsoft OS is also the only one expected to have negative growth in sales (and we can see why). The survey also mentions the increased strain the increasing number smartphones will put on mobile networks. This will push vendors to make phones more efficient in their data usage - a field in which BlackBerry is apparently the leader. The situation in South America is a little different - the market has declined by 11% last year, but is expected to bounce back. Symbian was the leading OS (42%) followed by RIM (28%). We can feel the Android wave sweeping our office too. We've been on an Android diet for almost a month now, and we have a few more Android phone reviews in the pipeline as well. So the review portion of our homepage is bound to get all Androidish quite soon.